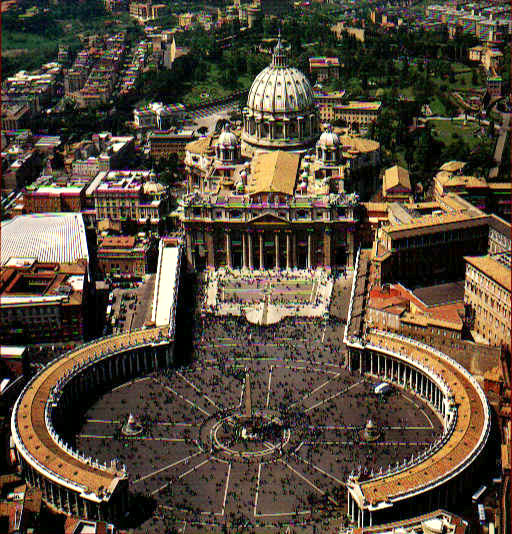 The changes in the plan of St. Peter's in Rome also exemplify the changes in style from the Renaissance to the Baroque periods. 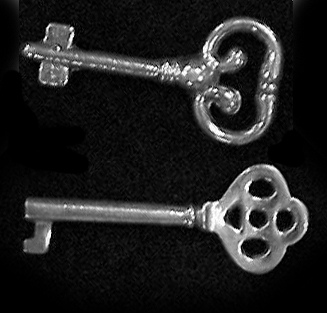 If you look at the overall changes in form they actually become more and more ornate, complex and even theatrical in design as we move through the periods. 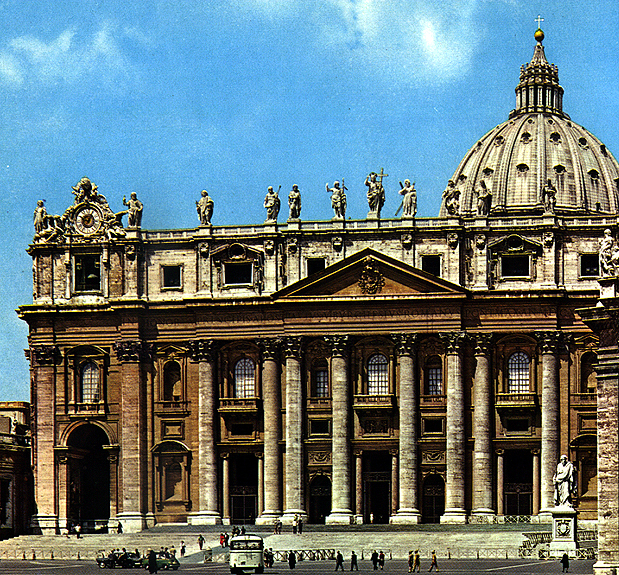 Form: The Plan of St. Peter's goes through several radical changes over time. It started as a basilican tau plan ("T" shaped) in 315 CE. 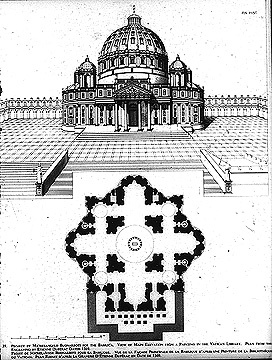 When Pope Julius ordered the original building torn down Bramante designed the building to be based on a Greek cross central plan. 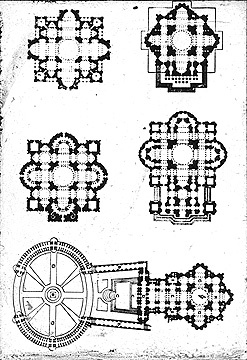 Unfortunately, Bramante's design was a little unstable and Sangallo redesigned the plan. Sangallo and Michelangelo both thickened up the walls and slightly simplified Bramante's original design. 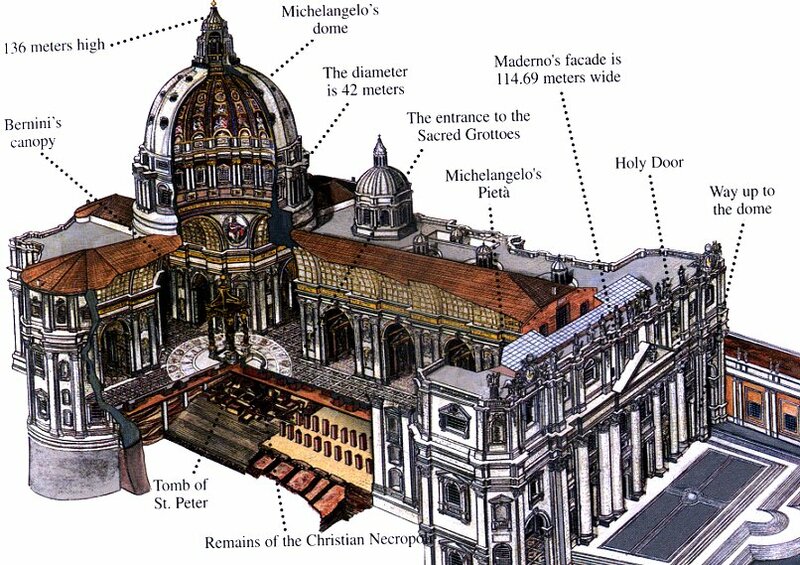 Michelangelo also redesigned the dome and the facade of the structure. His design was to create a more egg shaped or pointed dome than Bramante's original design because the shallow half sphere of Bramante's design was structurally a bit unstable. 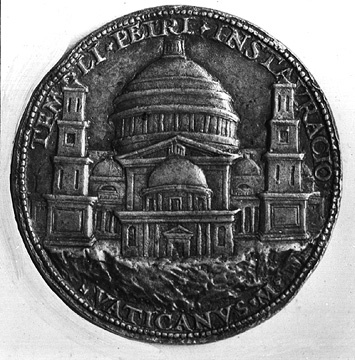 Michelangelo's design was then completed by Giaccomo della Porta in 1590. 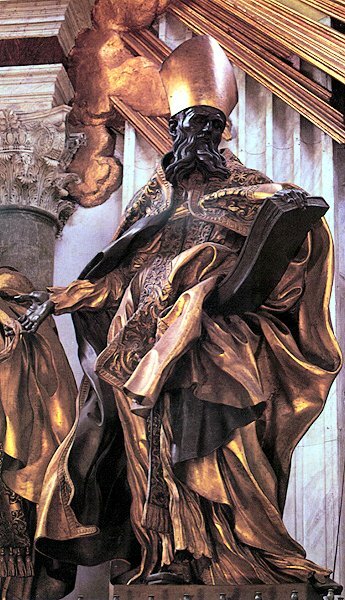 Carlo Maderno St. Peter's facade 1605 Form: Maderno's facade is almost the perfect example of the term "Baroque." It is extremely complex and uses a classical vocabulary but with some very Mannerist twists. The facade of the structure is really a combination of two facades. The pediment above the central doors is too far down the building. 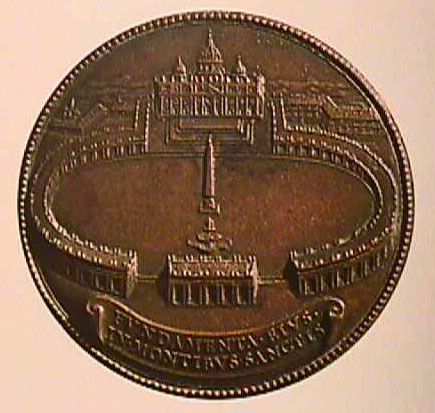 This is very similar to Palladio's design for the Church of San Giorgio Maggiore, Venice. Begun 1566. Initially the facade appears to have a symmetrical standard formula for Corinthian order buildings but over all the combination of the forms is irregular. 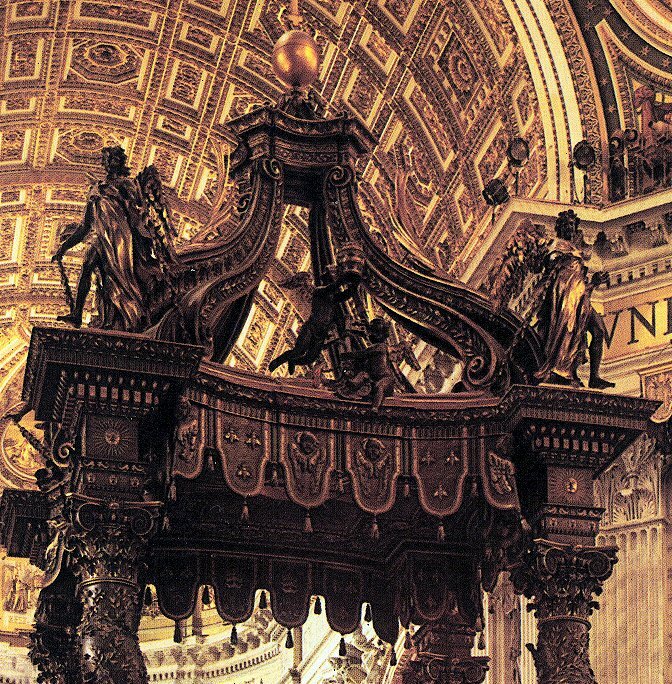 St. Peter's has the mark of almost every important Italian artist from the 1500's to the 1700's. 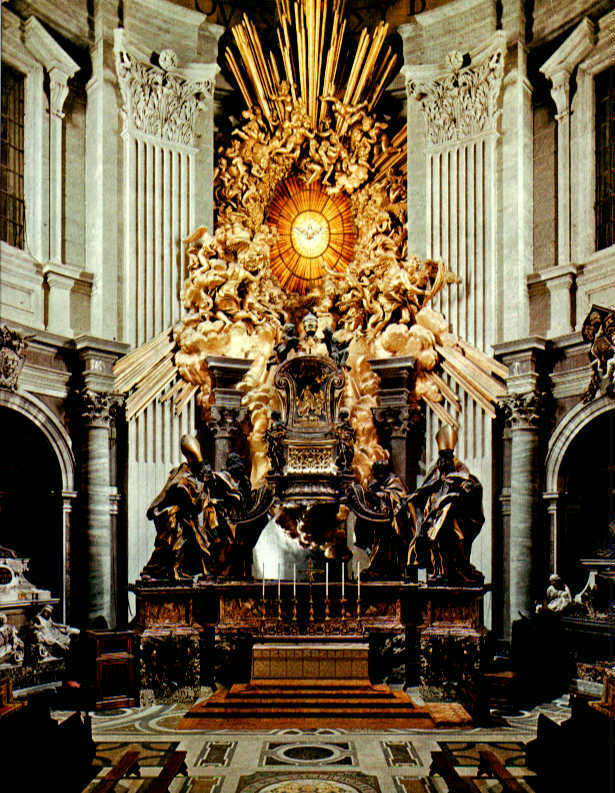 Even when the chance to redesign the over all structure or even the exterior facade, Gian Lorenzo Bernini still took it upon himself to redesign, or at least redecorate the interior of the structure. 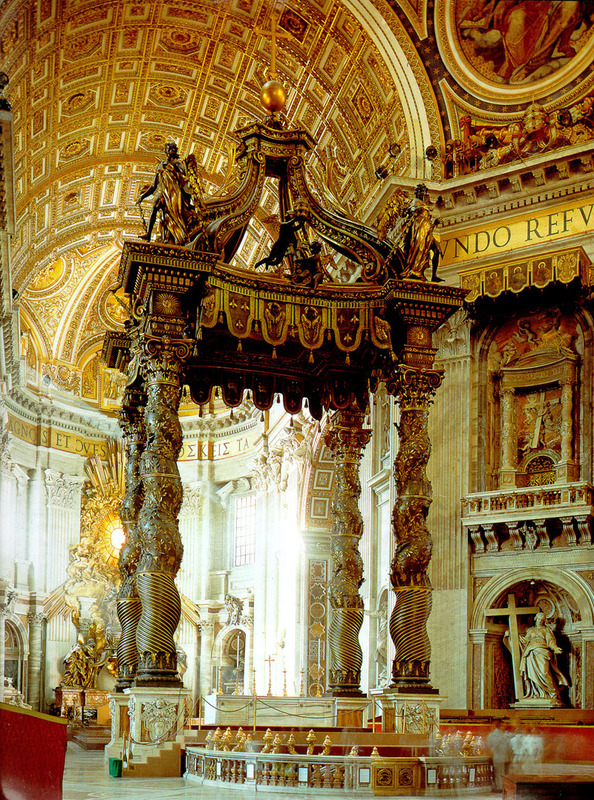 There are many places where Bernini's has redesigned tombs, stairways and altars. 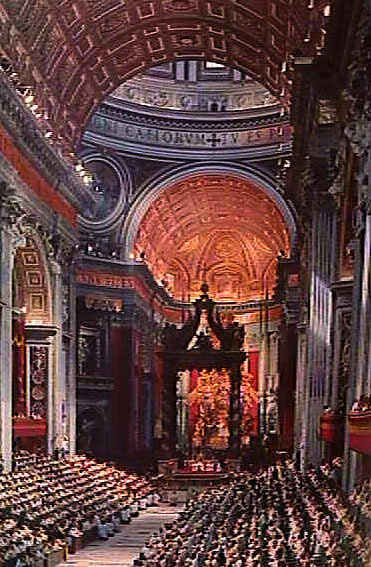 The two most important are Bernini's Baldacchino 1624-1633 or canopy located directly under the dome at the crossing and his Cathedra Petri 1656-1666 (Chair of St. Peters) located in the eastern apse.